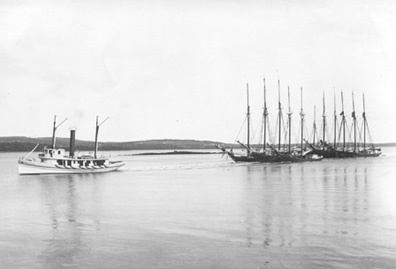 Tug Bismark off Odom's Ledge, Fort Point, towing six schooners up the Penobscot River to Bangor. The 103' Bismark was built in Philadelphia in 1888 for the Ross and Howell Penobscot RIver fleet, by the Chas. Hillman Company, with a compound (two cylinder) engine by well known engine builder Neafie and Levy. She was the most popular towboat on the Penobscot, powerful and smooth. Her career ended in New York Harbor after being sold in 1910 along with a number of other Penobscot tugs.